It was a dream of mine to walk up the mountains to the Tirupati Tirumala Devasthan. When I shared this with M, the 14 km hike up more than 4000 steps did not dissuade her. My dream became her’s too! Last summer, after a week-long tour of Aihole, Badami, Pattadakal and Hampi, we took an overnight train to Tirupati. My cousin dropped us off at the base of the hill and drove on ahead. We started walking up the hills just after 11 on a scorching hot day, with temperatures reaching 41 deg C (105 deg F). 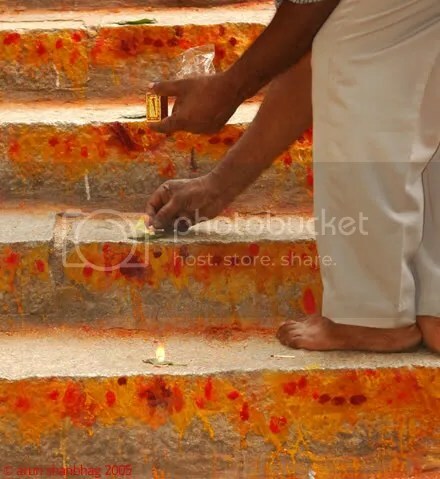 As we started, we realized that it was a tradition here to smear the riser of each step with ochre turmeric paste and the bright vermilion sindhur. Mainly women performed this service – an act of self-sacrifice in thanks for, or in anticipation of, wishes fulfilled. Witnessing scores of women, young and old, so devoted, is what ultimately got us to the top of the mountains. What a beautiful and enlightening experience! At the start of the walk, this life-sized figure demonstrated the correct manner of prostrating before the temple. It too was not spared the colorful demonstration of devotion. 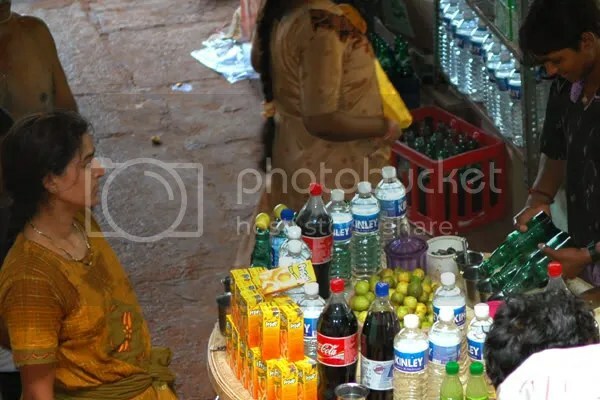 Along the way I witnessed nearly 50 women smearing turmeric and sindhur. I gazed in wonder at their back-breaking act of devotion. Here, two women pay homage to a step. One smears the turmeric paste, while the second overlays the red naam or tikka. Then she places a small leaf on each step. Unusually in this case, a young man followed and atop each leaf he placed a tiny piece of camphor and lit it with a matchstick. And on they went, on and on, seemingly for ever, one step at a time. Within an hour of walking in the stifling heat, my enthusiasm waned. The camera started to weigh a ton. Miscellaneous items in my back-pack felt like boulders. 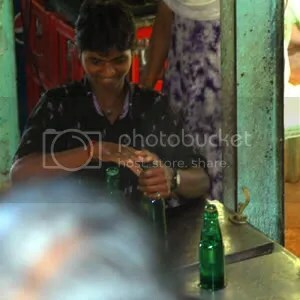 We rested often and drank copiously of the Limca or nimbu soda from wayside vendors. M&apos;s energy never ebbed! She smiled, even as she labored up the stairs, convincing me to hide my own fatigue. Thus we deluded each other, smiled and walked on. We rested often, observed others and spoke only briefly – it took more energy to mouth words. … and pours the gurgling soda in the cup with a lime already squeezed in it, along with a spoon of sugar and a pinch of salt. A completely exhausted walker awaits the potion expectedly. 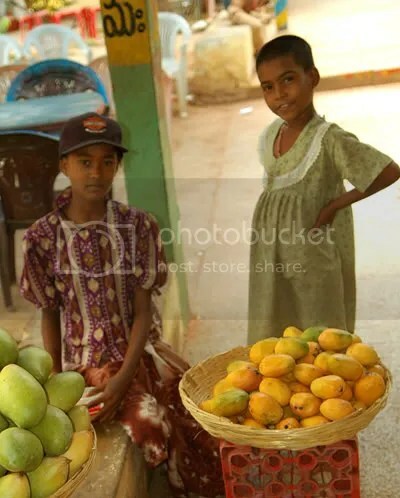 Girls selling mangoes along the way. The day had not started well. The train was scheduled to reach Tirupati around 7:30 am and we had hoped to start walking in the cooler air. The train was very late and it was a sizzling hot day. Further, at the temple center near the station, we are told the earliest we could get entry wrist bands was for two days later! Since our plans to head back to Bangalore the next day and Mumbai thereafter were already fixed, we opted to forgo the temple entry. As tired feet carried us up, this thought kept gnawing at me. “Despite this long and tiring walk, we may not be able to enter the temple and get darshan, afterall.” If I gave up, so would M. I quickly needed a save, particularly as M repeatedly asked, “If we don&apos;t have tickets, how are we getting into the temple?” I was at a loss. In desperation I tried to convince her that the divine is everywhere. What&apos;s so special about a temple anyway? Initially, my words were hollow, means to keep M motivated, but the more I mouthed them, I too started believing. I too felt the energy from the devoted women smearing turmeric. Hear ye! Hear ye! The divine is not in the womb of the temple on the hill, decorated with diamonds and rubies, with prostrating celebrities and rich potbellied merchants. She is here on the steps! In the murmur of the women who faithfully adore each step to her abode. Their breathing is labored and sweat dribbles unnoticed. The divine is here in each step of the aged mother, as she guides her daughter to leave her mark. Her other hand steadying her throbbing knee. On her lips – Venkatesha! The divine resides in that little girl selling mangoes. Though only a four hour bus ride from Bangalore, – she might as well be a million miles away. Uneducated, she doesn&apos;t whine on blogs of how unfair life is. You want to make her day? Buy a mango for a little over 10 rupees (20 cents). Yes! if you want to experience the divine, skip the air-conditioned drive to the top of the mountain and walk. Walk among the devotees. 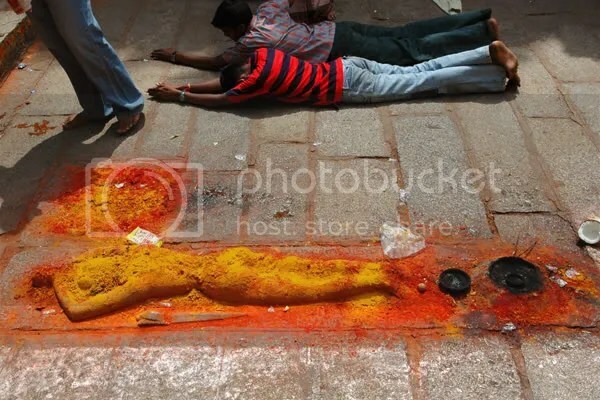 As they smear turmeric and sindhur, they chant their prayers and wishes. As our own feet fall on each step, I realize, these are not mere blocks of concrete, but lodged inside are the prayers of millions of true devotees who have walked before us. Millions of women who painstakingly smeared each step. 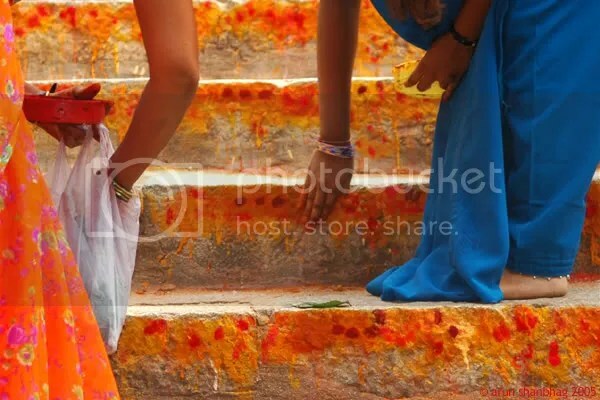 Women, tired of body but alive with spirit, who simply said “I leave my prayers on your door step, Srinivasa!” Those are the stairs we walked on. As I raised and lowered each foot, I thought of the prayers bound to each step. What a privilege it was to walk here; on the offerings of so many. The vigor in our strides renewed and we floated on this cloud of prayers. We walked and we smiled! We had seen the divine here! And experienced her grace. Visiting the temple would be a formality! Carving on a doorway. 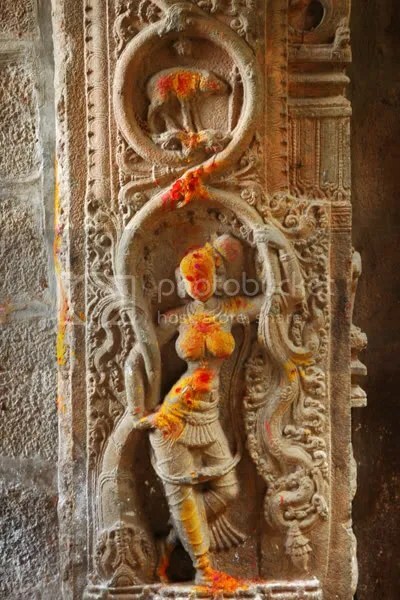 Above the damsel in the intertwined vines, Vishnu&apos;s varaha avataar is carved. A common observance at all Vaishnava temples. 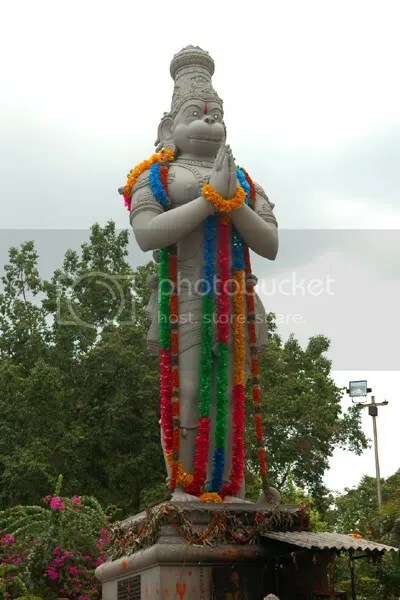 Anjaneya (or Hanuman) towers over devotees near the top of the mountain. Epilogue: Once we reached the top, my cousin had arranged for me to meet with the head priest of the Tirupati Devasthan. He was interested in the book I’m writing on Hindu prayers and agreed to help with discussions of the Venkateshwara stotra. He shared details of various services and traditions at the temple. He showed me an ancient copy of the Venkatachala Mahatmyam which his father (himself a one time head priest at the temple) had given him. And in the midst of our chat, … he softly asked if we needed passes to get darshan early the next morning! Just like that! After the long and exhausting day, I was simply overcome. That night we went for a walk to the temple complex and I did not even feel like taking a picture. I had already taken the important pics. What else was there to capture? And yes, the abode of Srinivasa and Padmavati appears a bit hazy here! But I&apos;ll come visiting again! Tirth Yatra: Temples of Tamil Nadu. Great Penance: Descent of Ganga. I admire your devotion, courage, empathy and above all your spirit of sharing. Before I went to Kailash I read your Parikrama diary which prepared me physically and spiritually to undertake that Most difficult yathra at age 68! Glad you completed the Parikrama. The grace of the divine is so powerful and uplifting, it lights everyone and everything in its path. I walked 3 times and my experience was very nice, last time I walked in 2005 and now after 10 years I walked with my kids and they throughly enjoyed walking Tirumala Hills without cheppal . Magically this time I don’t even had any leg pains . Thank you for sharing that and apologize for the delayed reply. One of these days, we’ll walk with Meera. Certainly the hie up to Palani is shorter, but this will be doable for you; Don’t rush yourself and remember to enjoy yourself. Thanks for the motivation…we went!! we climbed and we were fortunate to get audience with the lord….it was tiring but a very humbling journey!! Loved every moment of it. Did you mean “Anjaneya” ? You are absolutely right, will fix later in the day. The LORD is great..! i had no leave grant till today .. i was upset as all my family will go to tripathi for the lord blessing i will missed out. all od the sudden.. total program in my office is changed.. all the thing is postpond now i will have is Darshan… as per plan. on JAN 25.. by walking. i also got very easy ticket to India. which never happens to me when i general plan to vist my home. Ticket price is so cheap.. all his Lord blessing. Iam travelling from Dubai only for his the Lord darshan. Let what may happen if Lord Venkataramana wants us to be nearer to him we will surely go by walk….. Venkataramana padha govinda GOVINDA…..
Nice writeup. if all goes well, me(n my wife) shall climb the holy hill this friday. Wishing you the very best during your parikrama. have not gone to Tirupati since then, but should on my next trip. Sure Lord Venkatramana will bless you with cheerful days for you and your family ahead…..
Thirupathi, Thirumala venkat ramana govinda govida. thanks for this description of the walk up to the temple at tirupati. i hope to do this soon. i’ve never been even tho i grew up nearby… thanks. You should do it! One of the more fabulous experiences. A very well written and inspiring piece. Recently I accompanied my young daughter on her walk from Koparkhairane (Vashi) to SiddiVinayak temple. Some 26 Km. I felt great and pledged to walk up the Tirupathi hills. I had done it when I was a school boy in 1964, when there were no facilites. I googled to find some blogs and found yours. I am inspired further. You are right in saying that there is more piousness is in the poor, who have steadfast faith in anticipation of succour and climb up the path with devotion, rather than the rich who drive up. And awesome to hear of your walk from Vashi to Siddi Vinayak. I notice that this has become a modern tirth-yatra. Several of my relative have walked from Andheri and Khandivili. You are the first I have heard coming from Vashi. I wish you and your daughter find fulfillment in all that you seek. 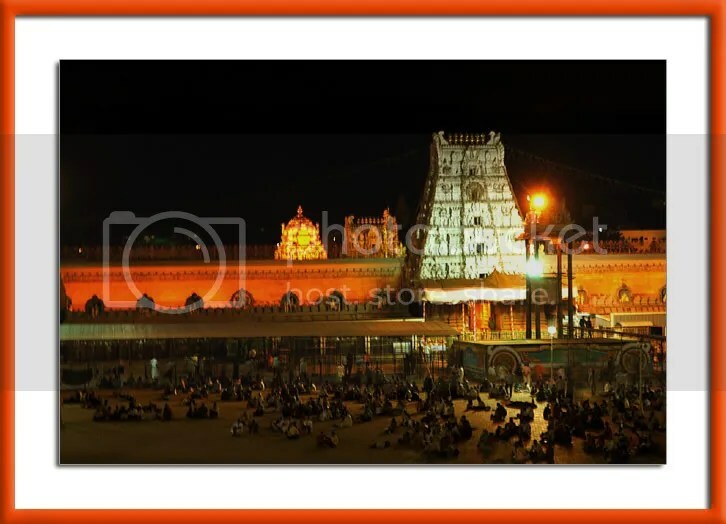 The walk up Tirupathi hills is something you will love! Not only the ultimate goal of reaching the feet of Venkatesha, but also along the way, you will be blessed by so many devout souls. That is the true blessing. And also along the way are certainly the refreshments, but also tiny zoo-like parks with a variety of deer. Hope you and your family get to do this walk.